What we need now, as MacKinnon and other thinkers have argued, is a new Magna Carta for the digital age- one that requires corporate providers of online speech to respect the rights of those who speak on their platforms, ‘No person or organization shall be deprived of the ability to connect to others without due process of law and the presumption of innocence,’ is the prime rule suggested by Tim Berners-Lee, the inventor of the Web…It might seem utopian to imagine this sort of regulation stitched together across nations. (In autocratic ones, it would be impossible.) But in democratic countries it’s not inconceivable. (Thompson, 276). I saw this picture on Facebook as well and thought that it was ridiculous that they removed this photo. I also am offended that Instagram thinks people should be offended by this picture. What is and isn't allowed on the internet is so weird and I feel like the things that get taken done often have to do with women's bodies. It's this weird social acceptance that still isn't happening. I remember you bringing this up in Visual Communication and I like that you've made the connection to this class. I think this is really interesting and I can't believe that instagram would take it down. I've seen people post images of blood from accidents and stuff that would never have been taken down, but because it is specifically menstrual blood, it's suddenly so inappropriate it has to be removed. So dumb. I really like the comment about "what is and isn't allowed on the internet is so weird and I feel like the things that get taken down often have to do with women's bodies." I think that's a great point. 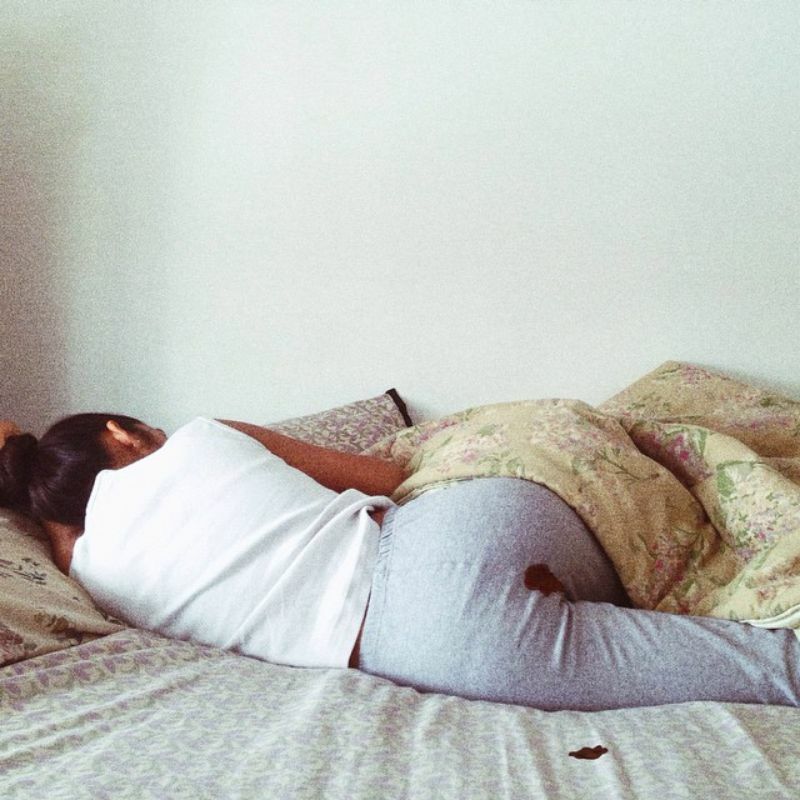 I've seen a lot of comments about this picture, but the one I most closely identify with says that since this picture isn't sexually suggestive, it's no different from talking about any other bodily function, so while it's natural, people can still be grossed out by it because it's blood. I saw a kitty litter commercial one time where the turds were pixelated, the way that breasts are pixelated on TV. The difference between those two subjects is that you can see one in plain view anywhere where people have dogs, but showing the other will get you potentially arrested. Great post. 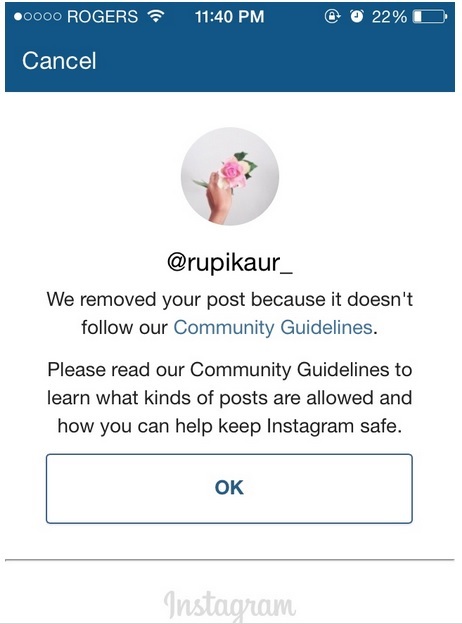 I've heard a lot about this controversy lately, Instagram did a similar thing recently when it blocked a photo of a woman who was showing off her stretch marks. I totally agree that there need to be new regulations protecting peoples rights on the Internet. It seems to be our new frontier.